Durable, rubber corner guards protect your corners from damage. One year warranty. Rubber Corner Guards have a wide variety of uses in industrial and commercial applications. Withstands abrasion and jolts. Rubber corner protectors provide maximum protection in storage spaces, parking garages and loading docks. Can the rubber be cut with a good pair of scissors? We want to buy heavy duty rubber corner guard. The material is EPDM or no. Did it test by ASTM D2000? Rubber corner protectors provide maximum protection in storage spaces, parking garages and loading docks. Installed on exterior corner of house to protect house and cars from damage. I installed guard by using 2 1/2 inch screws with counter sinked holes. I believe this will protect car and house when backing out of drive of a three car garage with a tight turn on narrow driveway. Driveway is also on a decline and can be slippery during winter snow and ice conditions. 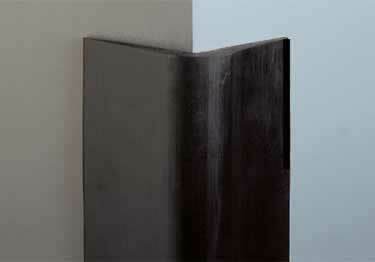 This corner guard is beefy enough to do the job in protecting and minumizing damage to car and shingle sided house. very happy with this product. protects my walls from abuse by the stage crew moving their stuff around. attaches easily with adhesive or screws in countersunk holes you drill yourself. Rubber corner guard. Good thick heavy duty material. Well constructed. Use vinyl or rubber corner guards as a low-cost alternative. Offers excellent protection against corner damage. Heavy-duty textured vinyl corner guards will protect your corners from damage while providing a decorative textured finish. KSC 4 ft, 6 ft Car Parking Stops and 8 ft Truck Parking Stops have strong, durable construction. Three color options. 100% recycled plastic with durable maintenance free construction. Available in yellow in 4 feet, 6 feet or 9 feet lengths. Impact resistant equipment to protect concrete columns, poles or racks.